The carmaker is partnering with US self-driving technology start-up Aurora to develop Level 4 autonomous vehicles – which provide a high but not full level of autonomy – by 2021. 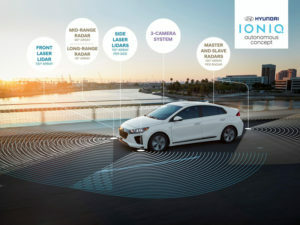 The partnership will incorporate Aurora’s self-driving technology into Hyundai vehicles starting with models custom-developed and launched in test programs and pilot cities. The technology will debut on Hyundai’s latest new-generation fuel-cell vehicle, which will make its official global debut at CES 2018 next week. Over the longer term, Hyundai and Aurora will work to commercialise self-driving vehicles worldwide. The Volkswagen Group has also announced that it’s working with Aurora to bring self-driving cars to “our roads quickly, broadly and safely”. Over the past six months, the two firms have been collaborating to integrate Aurora’s self-driving system in Volkswagen Group’s vehicle platforms. The partnership will focus on bringing self-driving electric vehicles to cities as Mobility-as-a-Service (MaaS) fleets as well as covering rural areas.